Apple now taking Red Cross donations through iTunes for Japan relief fund - iPhone.MY - Daily News On Mac, iPhone, iPads, iPods and more! Apple has opened up a new portal in the iTunes Store to take donations for the Japan earthquake and tsunami relief fund. Users who wish to donate can donate in $5, $10, $25, $50, $100, and $200 increments. 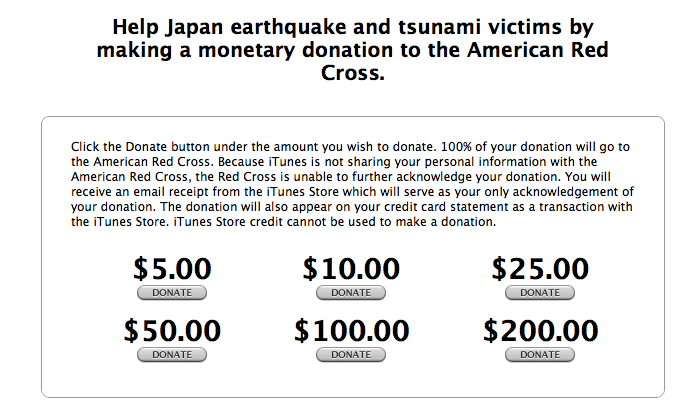 100% of the money donated through iTunes goes to Red Cross efforts in Japan. Click here to go the donate page.